Thanks to Vince Patel for reporting a remarkable situation which neither Royal Mail nor Post Office Ltd intended nor sanctioned. Harlow Post Office was a non Birds office at the time and should have only issued the standard Machin type faststamps! However Milton Keynes Post Office ran out of Post & Go Faststamps at the end of 2010 and Harlow PO let them borrow some of theirs. When Milton Keynes eventually got new stock in it was all Birds II stamps and to repay Harlow, they sent them Birds II instead of Machin type faststamps, which they put in their machine!!! 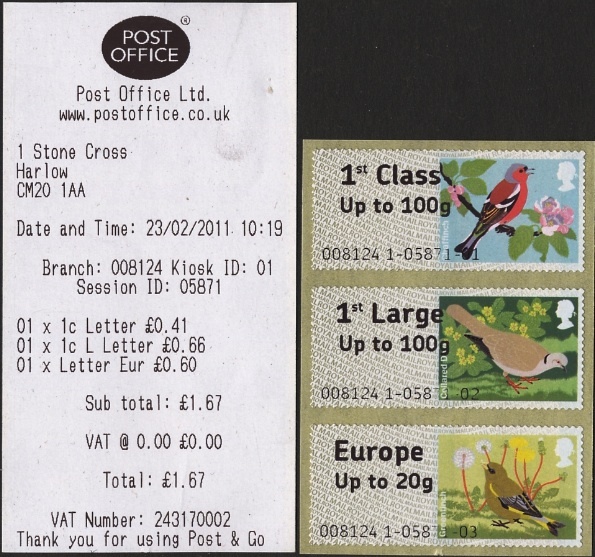 When Royal Mail discovered the mistake they instructed the staff at the PO to withdraw the Birds II stamps immediately and replace them with Machin type faststamps which they did on 23/02/11! All machines have now been upgraded to the smaller font and Birds series 3 stamps now!! Vince obtained a set of 6 from another collector, half of which is shown below. This shows the importance of vigilance - and of always getting spare copies of anything, for other collectors. Remember, if you run out of cash, the machines do take cards!